In issue four of "Milltown Memories" you wrote a very kind article as a tribute to my late father Jack Uttley. To illustrate his skill with a camera, you included a photograph taken by him. We were very grateful and pleased with the tribute. However in issue 11 you have published a letter from Mr Jim Brown in which he claims the photograph to have been taken by his uncle Willie Brown and that he is the lad in the picture. Furthermore you have added an editor's comment which accepts the claim without question. 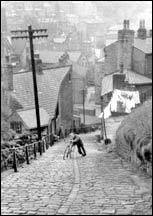 For the record we wish to state that the photograph was taken by Jack Uttley and that the boy pushing the bike is me (John Uttley). The letter and your comments appear to question our integrity and we believe that you owe us an apology. Editor Issy Shannon replies: "Over to You" is an open forum given over to readers whose observations and opinions are not necessarily those of myself, as editor, or the publishers. My comment in this instance, however, appeared to endorse the claim expressed by Mr Brown and as such was ill-advised. It was never my intention to cause upset or offence to the family of the late Mr Jack Uttley. Read the full story in Milltown Memories, issue 12. If this or other stories stirs a memory, we'd be happy to know - send us your memories and comments.